Nowadays a new emerging technology is Internet of Things (IoT). This post describes how to create Internet of things system with Android and Arduino. In IoT project, all the physical objects (things) are connected together using internet infrastructure. Arduino board is one of the most important objects in this ecosystem. In this post, we will explore how to integrate Android with Arduino making the first step in IoT. 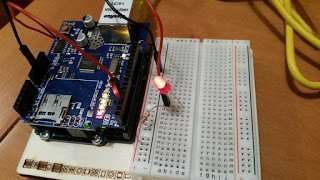 We will build an Arduino IoT project using a step by step guide. All the objects are on the same network for simplicity. 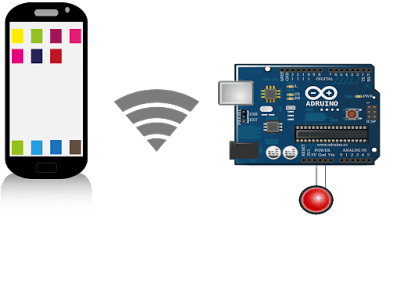 The idea of this Arduino and Android IoT project is building an Android app that exchange data with Arduino. To this purpose, the Android app will communicate with Arduino using the HTTP protocol. 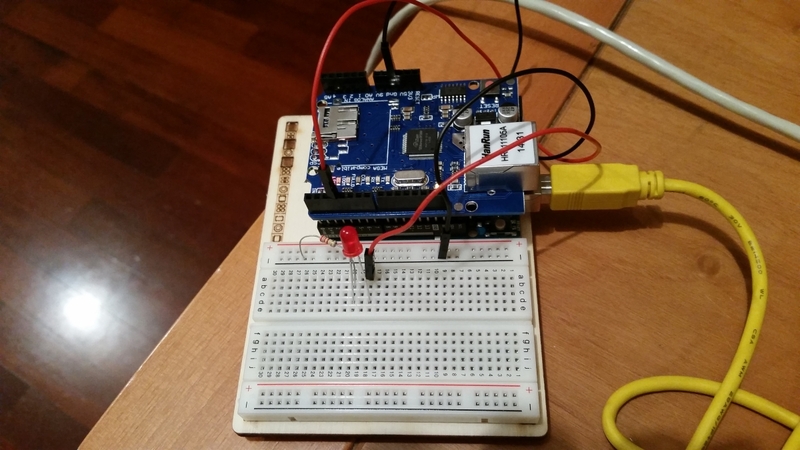 A very small and simple Web server runs on Arduino, accepting HTTP request. For simplicity, the app sends JSON data that holds the led status. Below you can download the Arduino source code for this Arduino IoT project. Almost all the arduino source code is used to handle HTTP connection. Notice that at line 4 we set the MAC Address of the ethernet shield while at line 5 we set the IP address. In this way Arduino is ready to be integrated into our internet of things world, it can exchange JSON request with the external application including an app that runs on a smartphone. 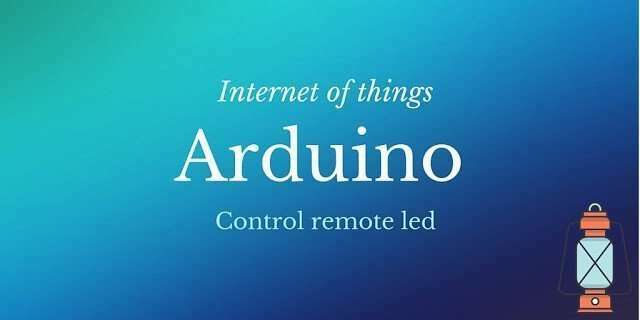 In this first part of Internet of things with Android and Arduino project, you gained the knowledge how to handle HTTP request in Arduino. To complete our Internet of things with Android and Arduino scenario, it is necessary to implement an Android app that sends JSON request. 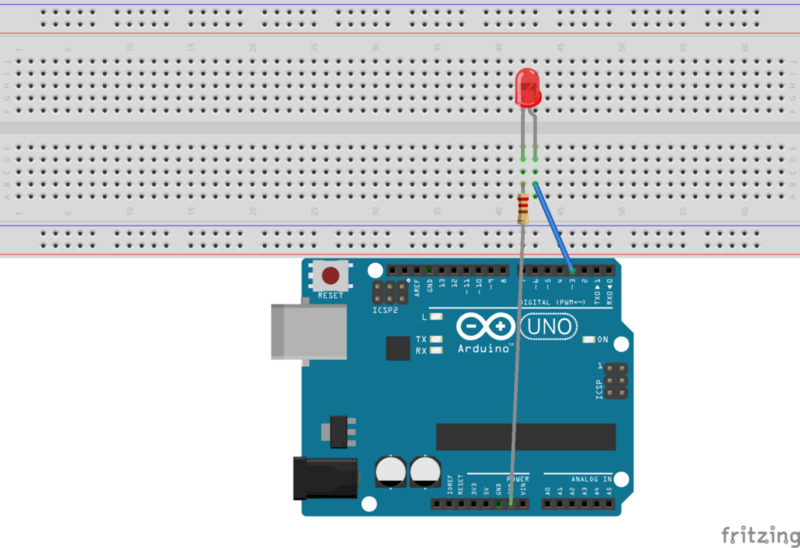 There is one simple button when the user clicks on it, the app sends an HTTP request to Arduino, that runs the web server. If you want to know more about HTTP look at making HTTP request in Android. In this post, you gained a basic understanding of how to create Arduino webserver example and how to connect it to the android app. This project can be extended and could be used as a base for arduino home automation. It is possible to make even more complex project that uses Android app and Arduino to control an RGB led. This Internet of things project with Android and Arduino showed how to integrate two different ecosystems and make them work together. Any way to impliment this with Outlook. Say, whenever you have an unopened email in your inbox, the light goes on? on the arduino sketch on line 2. Hi, it was an error when copying the source code. I corrected it and now should be ok. Let me know if you experience any other issue. Thank you for your time. The idea is the same, you should check, using some Mail Api, if there is an unopened email and contact arduino to turn on the light. it's very simple and good project for starter. so, If you don't mind, I would like to introduce on WIZnet museum (http://wiznetmuseum.com) for everyone. WIZnet produce the W5100 chipset on Ethernet shield. Hopefully, you will allow this. as i’m facing some errors with my project . What kind of project would u like to create? Hello Sir! I’m Vaishak. I have planned for an IoT project with agricultural applications. Will you help me out with it? You should tell me more about this project so that i can have an idea. Now I’ve decided to use humidity sensor, soil moisture sensor, and temperature sensor and a water pump which works depending on the criteria of these sensors and carries out drip irrigation. I’ll the Arduino microcontroller. The name of my project is “ENHANCEMENT OF AGRICULTURAL APPLICATIONS USING IoT”. The whole system is controlled through GSM or Wifi. I am vivek anand from india. I just want to know that which bluetooth module is better with Arduino for multiple command. as far as i know you can use every bluetooth module you like. You could prefer a bluetooth shield that is connected on top of arduino board or a external module. It is up to you. For my project i use an external module. i’m usmar ismail from indonesia. the android part is in the tutorial. Are you looking for a complete android app source code? If so tell me, i will add it to Github repository. sir i’m using enc28j60 with uipethernet shield.and control lights via android apk. but problem is that when i press button for led onn/off it will react after 2 to 3 second later. if i use same apk with wi-fly module rn-171.it reacts within milisecond. how can i improve speed in ethernet. Did you check your Internet connection speed? I should read the code to answer…. hello sir. i want to create a combination of smart mirror and smart window for my iot project with my partner. we want to use the idea of smart mirror and put the idea on the window. the idea of smart window is still there and we just want upgrade the functionality of smart window become smart mirror as well. both of us are lack of knowledge of the arduino. our final year project coordinator wants us to use arduino and preferred the arduino mega. will u help us out with this? we really need help. Hello, can you please send me the full code via github? I cant find it there. Thank you. the android part is it on Github repositoryt? i’m looking for a complete android app source code? Hello sir i want to do project with IOT in the AWS inftastructure…could you please help me to select the idea which king of thing is doable with in 6 weeks.?? i am a last year eng student,i have a plan to do a project which uses a android application that control a electronic device through internet.i want to get data from the device and store in a server also eant to retrive the data in the app. I’m trying to develop an android application for my IoT project. The project is to sense temperature using LM35 temp sensor, send data to thinkspeak using Arduino UNO and ESP8266 wifi shield. The data is analysed at thinkspeak and I want to display it in the app too. Then the app’s user will determine whether a fan has to turned on or not depending on the temperature readings. So far I’m able to send data to thinkspeak and analyse it only the app development part is left. 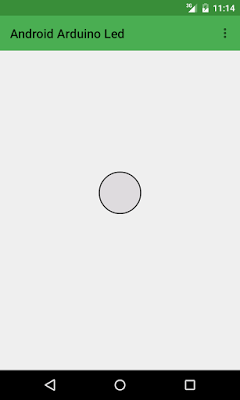 I’m completely new to Andriod app development. Could you please help me in accomplishing the task?! Hey i got a problem, my status just give “n” and i don’t know why, can you help me? Hello Sir, i am rizal from indonesian, can you tell more about source code android app in this project.? i am confused because the code is not full. or the project is it on github repo? i am looking complete android app source code. We are the WIZnet Team in India. We have been searching some application references in which WIZnet solution is applied and found your project “Control RGB LED using Arduino and Android “. I. Your development looks very cool & smart. Recently we have developed WIZnet Museum (http://wiznetmuseum.com) site. This is an academic-purposed collection of open projects, tutorials, articles and etc from our global customers. If you are O.K. we would like to introduce your project and device in here. Hopefully, you will allow this.